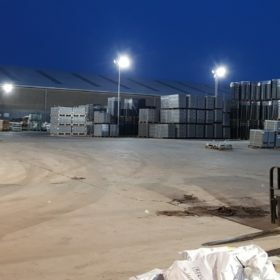 Replace existing flood lighting with energy efficient LED luminaires and additional supplementary luminaires to improve lighting levels to all areas. 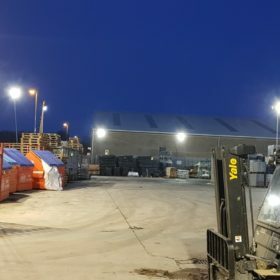 Replacement of existing external flood lighting and installation of additional flood lighting to give the good even standard of illumination needed in a heavy work area. 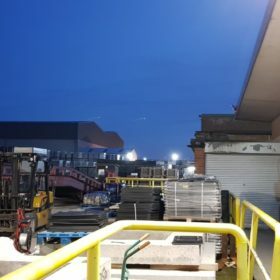 Working around a fully operational storage yard and allowing the staff full access throughout the installation. We delivered an energy efficient LED lighting solution whilst also upgrading the lighting levels to all areas to a much high standard. The project was delivered to the client’s brief on time and of course on budget. The installation was fully tested and commissioned before being signed off by the client. All relevant test certificates & recommended maintenance schedules were provided with the As Fitted documentation.